I'm Miss Piggy! Pleasure to meet you! I'm a Pot Belly Pig! I just love to "hog" all the attention! In this picture...I'm only 4 months old! 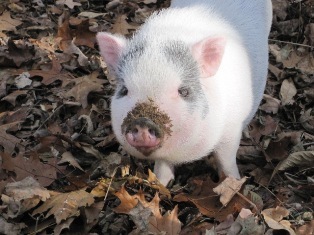 Dottie thought taking care of me was just like all the other "farm" pigs she had! Not! This...she is now finding out! To learn more about me....click here! To learn more about the other critters....scroll down! I'm Mat! I'm 3 weeks old in this picture! I was a bottle fed baby...but I had to give it up because everybody said I was too old for a bottle! I learned lots of tricks! I can give you my paw...and the other one! I stand up on my hind feet for "Up Pretty", and walk forward AND backward! I can even walk across a 2 x 4! I get to visit people and do my tricks to make them smile! Well... hello there! I'm Bunny! That's my name...Bunny...or Bunny Bunny Bunny! Whatever! I like to think I keep this gang in line! I'm a house bunny for now...'till Mat and Piggy are ready to go outside! I kinda like it! First I had to smarten up the cats! They're the ones who smartened up the dog! 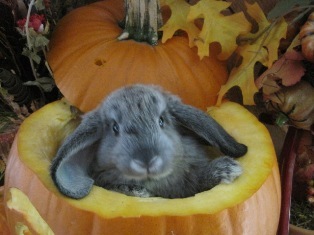 They need a little Bunny in their life! So here... I... am...the Bunny with an attitude! Want to know even more about me? Click here! My name is King Solomon...but they call me "Solly"! 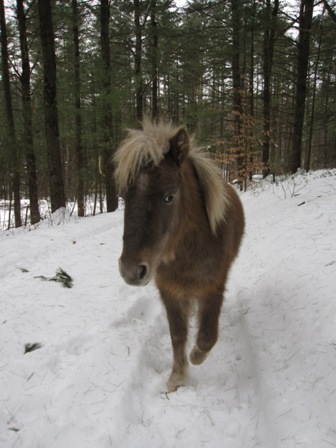 I'm not a pony...I'm a Minature Horse! I'm almost 3 years old! And yes...I am... all... that! I am so smart...that I'll teach YOU tricks! I'm always getting into some kind of trouble, but it's just because I'm so smart and I deserve all the attention. I love to eat...my hay...and every one elses! I might be a little bossy, but where I came from, they were all BIG horses and they always pushed me around. He- He- He! Now it's my turn! Joe calls me Eddie Haskil, from a beaver show on tv. Hay!!!! I'm Donk E. Oaty. My name use to be Jack ...but I liked the way everyone said...."Oh... What... A... Cute... Donk... E"! So we changed my name! You can call me Donk E for short! I use to be at the bottom of the pecking order because I was the youngest! But now that Mat came to live with us...I grew courage! I'm a big brother, now! It's my job to protect him...and keep him out of trouble! He He He! I have the biggest ears... so you can tell me anything and I promise... I won't tell a soul! I'll bring you my brush, I walk through a hula hoop, I bring back a set of plastic keys after you toss them! I'm learning the cha cha and I can bow when I'm done. I'm happiest when you sit on the bench, rub my ears and give me lovings. I give the best Donk-E hugs! Hi! I'm Sir Galahad! I'm a 9 year old Alpaca! I've been with Dottie for only a year! We've come... a... long....way! I'm still a little shy...but I will come to you, and gently eat from your hand. I absolutely love cherios! I've learned quite a lot since I've been here! The most important thing ...was to trust! So...that's what I like to teach! I hum when I go on woods walks...especially when I get to munch on the pine needles and oak leaves...yum! My favorite feeling? That feeling I get running through the forest with Solly and Donk E! There's nothing like it! I'm Bart! 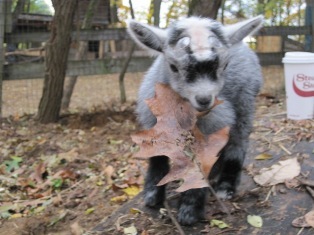 I'm a Nigerian Dwarf Goat! You'll see me in the first part of our journal! I had to pass on! But hey! I was 18 years old... which is really old for a goat! I had my very own fan club! 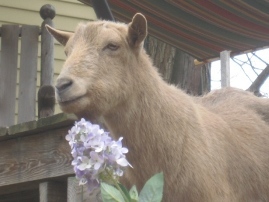 Find out why I was called The Best Goat Ever!